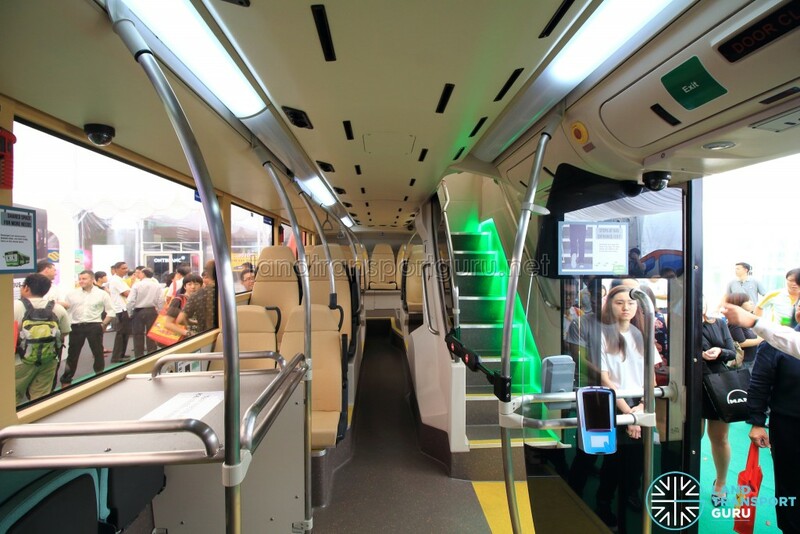 For the bus on revenue service trials with Tower Transit, visit LTA evaluates 3-door MAN Lion’s City DD Concept Bus. 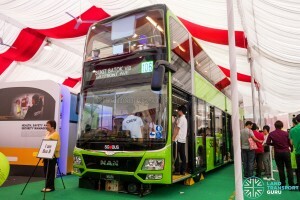 A MAN Lion’s City DD L Mock-up Bus, decorated in Lush Green, made its debut appearance at the Land Transport Authority (LTA)’s Our Bus Journey Carnival at Ngee Ann City. 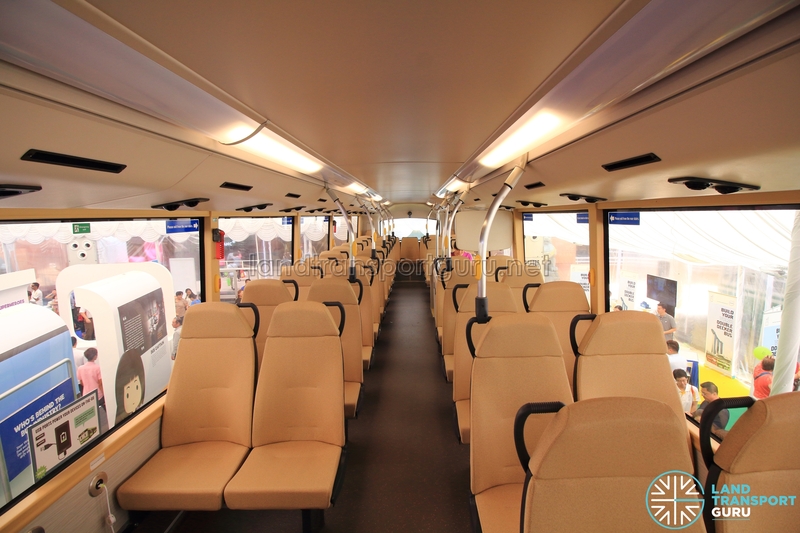 The bus is one of two concept buses commissioned by LTA to provide the public with a glimpse of how buses would look like in the future, the other being an Alexander Dennis Enviro500 (2015 Facelift). 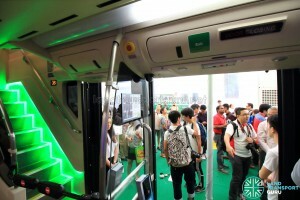 The concept bus features three doors and two staircases, with new features such as seats with headrests, USB charging ports, stylish interior lighting and a Passenger Information Display System, that gives real-time information on the next bus-stop along its route, integrated with bus stop announcements. 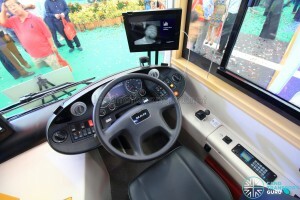 Multi-color Electronic Display Units (EDS) were installed on the front, kerbside and rear of the bus. 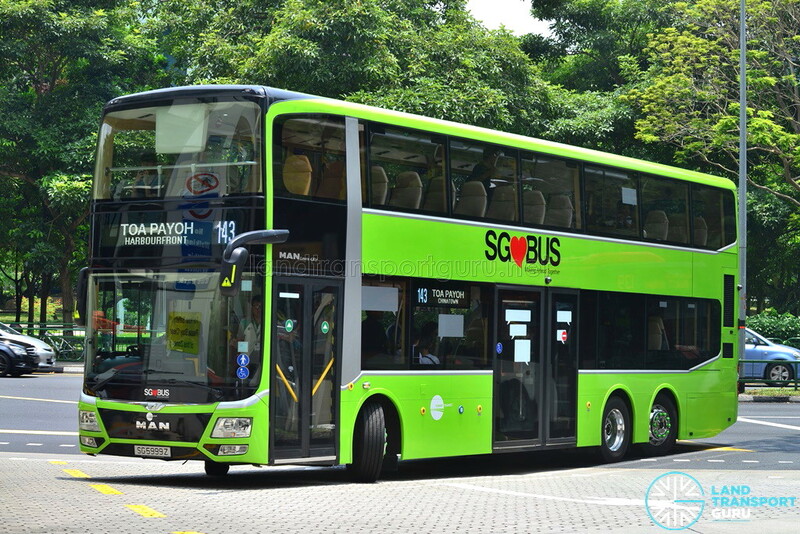 In March 2017, the same bus made its debut on revenue service for a trial period of six months, registered as SG5999Z under Tower Transit Singapore. For more information about the trial, visit the dedicated article at LTA evaluates 3-door MAN Lion’s City DD Concept Bus. 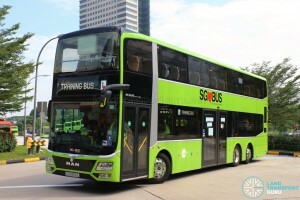 Contract PT236 was awarded to Singapore Technologies Kinetics Ltd for S$610,000.00 on 8 Oct 2015, and also to Alexander Dennis (Asia Pacific) Ltd for S$498,500.00, beating Cycle & Carriage, MCV, Yutong and Volvo. The MAN Lion’s City DD L Mock-up Bus was the final product of this undertaking. 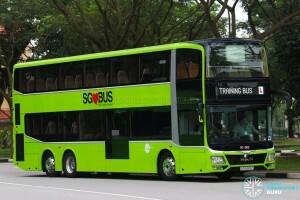 As Singapore Technologies Kinetics (ST Kinetics) was the local authorised dealer for MAN Truck and Bus in Singapore, it was only logical that their bus would be built on a MAN bus chassis. The bus was showcased at LTA’s Our Bus Journey Carnival in March-April 2016. Subsequently, it was returned to its bodybuilder in Malaysia, Gemilang Coachworks, for modification works. The entrance, which was originally a single-leaf Outward Swinging Door, was changed to a pair of conventional double-leaf Inward Swinging Doors. Reflective warning signs and stripes were also pasted on the wing mirrors. On Tuesday, 19 July 2016, the bus was driven back to Singapore. 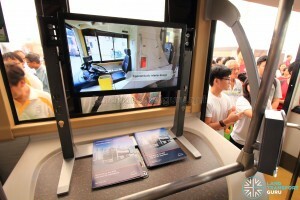 The bus was displayed during LTA’s Walk Cycle Ride (WCR) SG Symposium at MediaPolis the day after, where it was equipped with its number plate SG5999Z. Additional modifications were made, and the bus began revenue service trials with Tower Transit in March 2017. 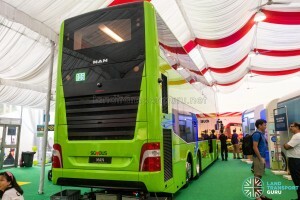 The bus is a 12.8-metre long MAN Lion’s City DD L, built on a MAN A95 chassis. Originally 12 metres long, the chassis was manually extended to 12.8 metres, by cutting the chassis before the second axle and adding a chassis extension by welding. Lower deck seating was sacrificed to make way for the rear staircase, which leads to a third door just next to the second door of the bus (both exit doors are controlled together from the driver’s cab). 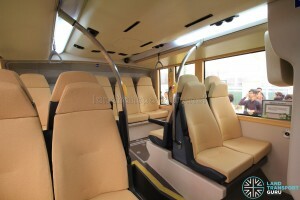 Elements of the rest of the interior design share characteristics with other MAN Lion’s City DD buses in Singapore and abroad. The additional “L” in the model designation indicates the extended length of this bus. 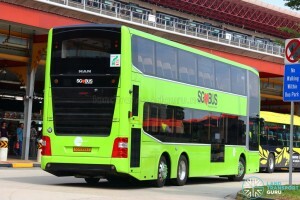 A three-door double-deck bus is not new to MAN; such buses were produced in large numbers for the European market, notably the design where the second staircase led to a third door at the back of the bus (similar to the ADL Enviro500 mock-up bus or the New Bus for London). 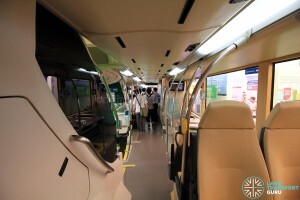 The unique design presented in the mock-up where the second and three doors function side-by-side as a single exit door is a new concept not new to this demonstration unit, but nevertheless a novel and relatively new design. 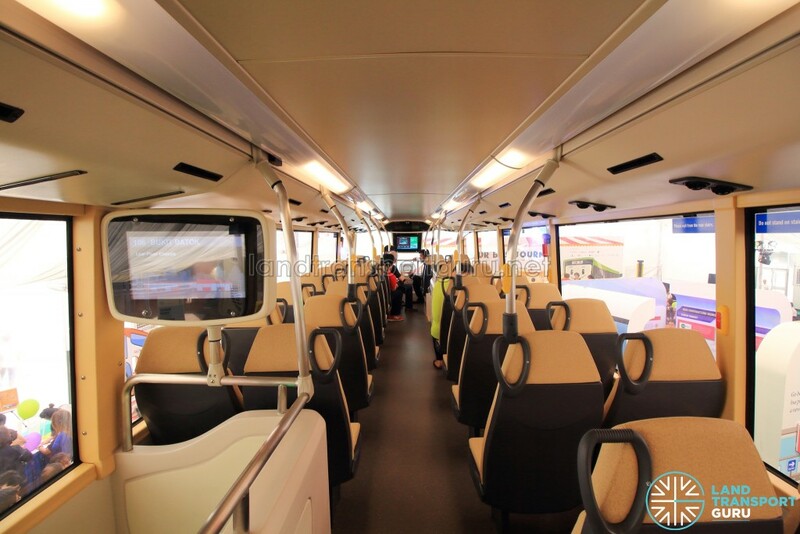 As the mock-up was built on an existing MAN A95 chassis, it is fully functional and equipped with an engine, unlike the ADL Enviro500 MMC mock-up where the engine was not installed. While exact specifications are unknown, the MAN A95 is supplied with either a 235kW/320hp or a 265kW/360hp Euro V engine. MAN also offers a Euro VI-compliant engine as an option, which consumes diesel exhaust fluids such as AdBlue. 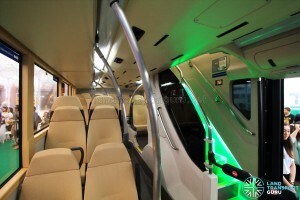 Throughout the duration of the carnival, the bus is powered by an external electricity source. 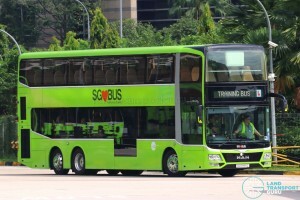 The construction of this bus was done in Gemilang Coachworks, an authorised MAN bus building workshop based in Johor, and subsequently delivered to Singapore as a complete unit. 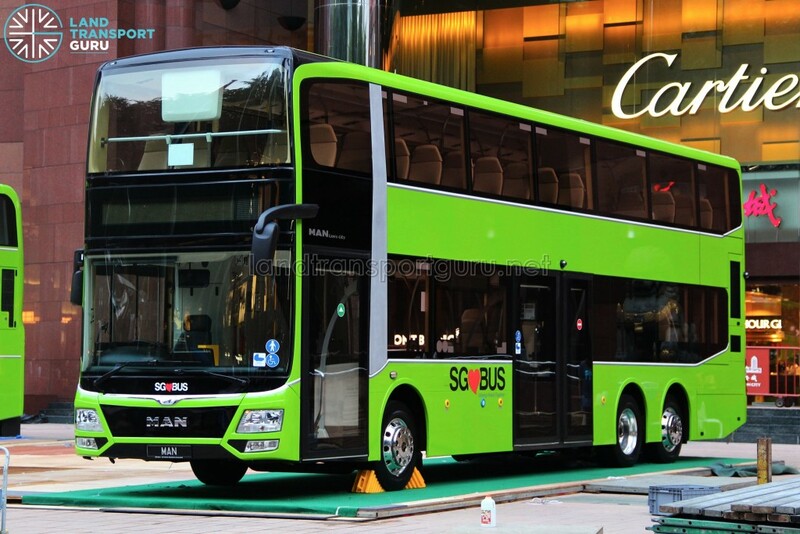 Construction of other Facelifted MAN A95 buses for the Singapore market is detailed in this article. The lower deck features 19 permanent seats. 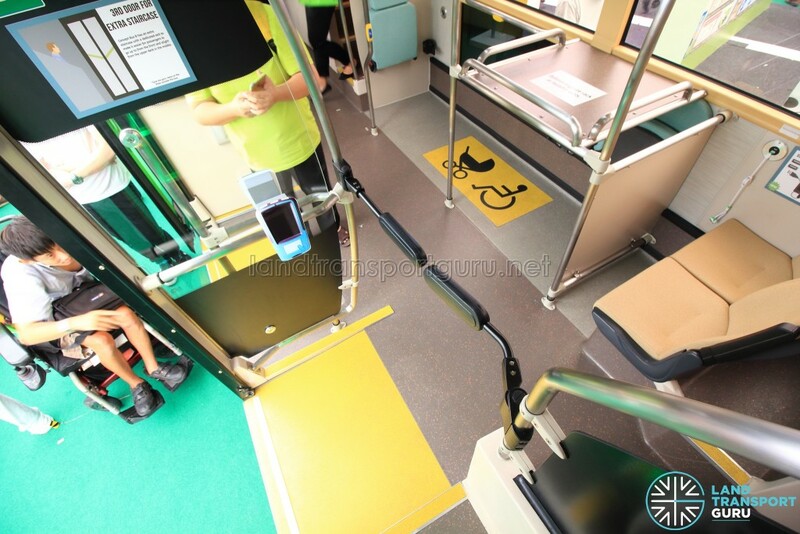 A single wheelchair bay opposite the front staircase can also function as a seating area with four foldable seats when the bus is less crowded and can be locked in the stowed position by the bus driver from the driver’s cab. 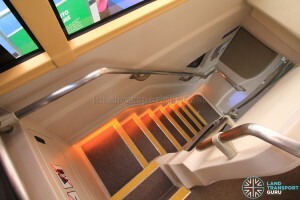 A second wheelchair bay is located behind the front staircase and doubles up as a single foldable seat when not in use. 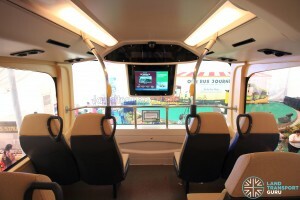 Depending on future specifications, two more foldable seats or a luggage rack can be featured, and this mock-up features both at the time of the carnival. A set of spring barriers allows passengers descending the rear staircase to re-enter the lower deck while preventing lower deck passengers from using the staircase, promoting a linear flow of commuters within the bus. 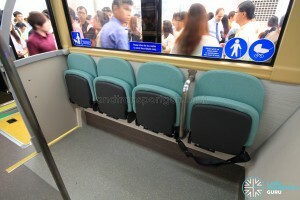 The standing area opposite the exit door can be configured with a luggage rack, two foldable seats or plain standing space. This mock-up features both luggage racks and foldable seats for display. The upper deck features 55 upper deck seats and two staircases. 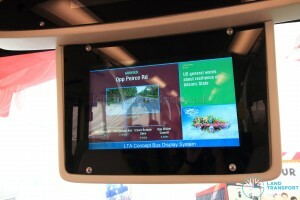 Also equipped is a fully functioning Passenger Information Display, which provides real-time information on the next bus stops along its route, integrated with bus stop announcements. Unique to this design is the pair of rear-facing seats just behind the front staircase. 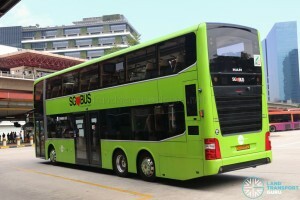 As most systems within the MAN Lion’s City DD L bus is in working order, the Land Transport Authority (LTA) intends to deploy the bus on revenue service trials with Bulim Bus Package operator Tower Transit. 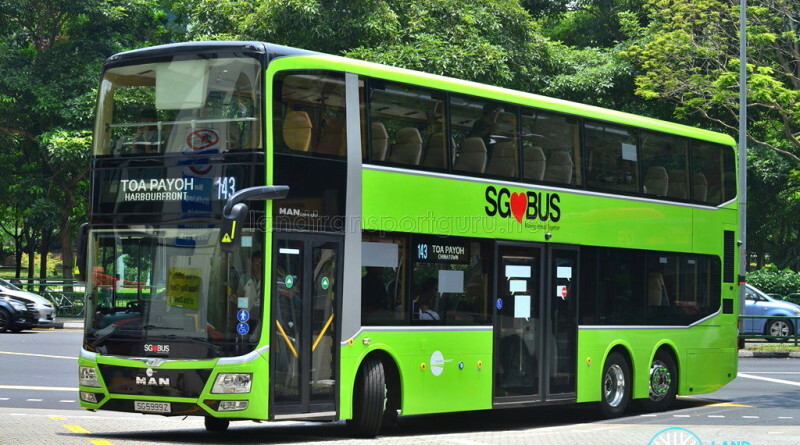 The bus was allocated the number plate, SG5999Z, which was first sighted at LTA’s Walk Cycle Ride (WCR) SG Symposium at MediaPolis on 20 July 2016. Under a Road Traffic (Authorisation of Use) Notification 2017, SG5999Z is permitted to operate on Bus Services 41, 78, 106, 143 and 189, all of which are operated by Tower Transit. The Authorisation of Use also covers bi-directional Off Service routes between Bulim Bus Depot and Jurong East Temporary Bus Interchange, Bukit Batok Bus Interchange, Toa Payoh Bus Interchange, Shenton Way Bus Terminal and ST Kinetics along Corporation Road. As part of modifications prior to the commencement of revenue service, the front doors have been replaced with conventional leaf doors, and the New On-board Bus Equipment (NOBE) and Trapeze Common Fleet Management System (CFMS) have been installed. With a steerable tag axle allowing the bus to navigate corners with greater ease, the Mobileye Shield+ Collision Avoidance System has also been fitted to cover potential blind spots. 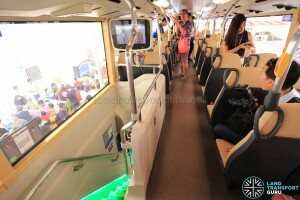 This system, featuring two externally mounted cameras at the rear of the bus, has previously been tested onboard SBS6650K, an SBS Transit Mercedes-Benz Citaro. The Authorization of Use is valid from 20 February 2017 to 30 September 2017 (both dates inclusive). Of noteworthy interest, the Off Service routeing from Bulim Bus Depot to Toa Payoh Bus Interchange requires the bus to exit the PIE at Kim Keat Link, rather than Lorong 2 Toa Payoh. 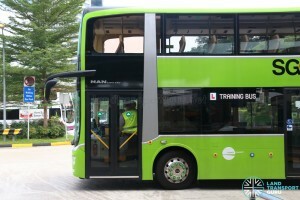 A day before the official launch, the bus was spotted on training rounds along Tower Transit’s Bus Service 143. 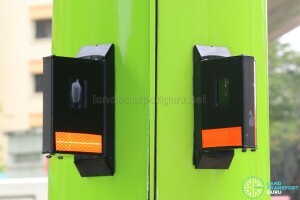 Green wheel nut indicators have been fitted by Tower Transit, along with company logos on the exterior of the bus. On Monday, 13 March 2017, the MAN Lion’s City DD L (SG5999Z) was launched on Tower Transit’s Bus Service 143. 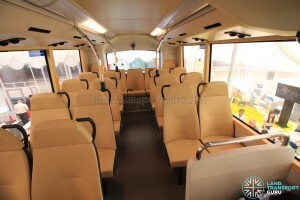 Visit the dedicated article at LTA evaluates 3-door MAN Lion’s City DD Concept Bus for more information. Where is the bus currently located at after the carnival?